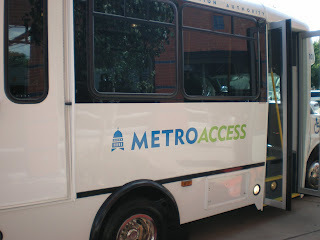 MetroAccess makes a special holiday delivery in one of its shiny new "sleighs"
One of Capital MetroAccess’ brand new paratransit vehicles left the Capital Metro parking lot this morning for its first public outing and a very special holiday delivery to 49 Central Texans. It’s not pulled by reindeer, but it was laden with gifts, and even Santa would be impressed by the roomy interior of the new MetroAccess vehicle. The bus was loaded with care packages for clients of a local nonprofit, H.A.N.D (Helping the Aging, Needy and Disabled) of Austin. Capital MetroAccess staff adopted ten of H.A.N.D.’s clients, and gathered up gift baskets of personal care items, household goods, food, etc. Some talented MetroAccess staff members even crocheted scarves for the recipients. 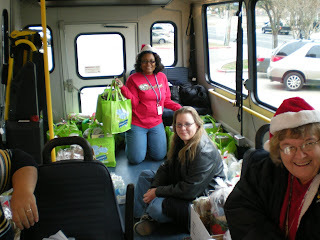 In addition to the ten we adopted, the MetroAccess “elves” helped H.A.N.D. by delivering baskets for another 38 of H.A.N.D.’s clients. MetroAccess “elves” show off the gift baskets and the roomy interior of the new MetroAccess vehicle. Earlier this year, Capital Metro purchased 47 new paratransit vehicles to replace older models that have outlived their useful lives. A handful of the new vehicles will go into service the first week of January, and all of the vehicles will be on the streets by February. Some of the amenities of the new bus include a slew of safety features, more passenger comforts like a smooth ride suspension and a quieter engine, a larger seating capacity, and room for service animals underneath each seat.